21-January-2007 : So you want power? As photographers there is something subtle we all seem to be looking for, especially when we travel. No, it’s not good light or the perfect moment, it’s power. Yes, power. Not the “I’m in control” power like the bouncer at the velvet rope of a cool club, but electrical power. We go home, we plug in our batteries, laptop and mobile phone. We go to a job we seem to walk into a room and immediately start looking at the space where the wall meets the floor for an outlet, we check into a hotel and the first thing we tend to do is unzip out bags and start plugging stuff in. Why not look for this same convenience while flying? Airplanes in seat are at the top of my list when planning my flights. I like to sit down, plug in and either charge my laptop, work on my laptop or put my seat back and watch a movie on a long flight across the continent. For international travelers there is more and more hope as new aircraft are rolled out and older aircraft (some only a few years old) are overhauled with new seats. For the international traveler many airlines are installing Universal Plugs that can take a US/Japan , UK and Euro plug without any adapter. These are ideal, but not the standard in the sky. The more common type of power on planes is called “EmPower” and various companies make EmPower Inverters or power tips (such as iGo) that will allow you lean down, look under your seat for a “green light” and plug in. EmPower is currently used by more airlines than any other type of in-seat power, both in the US and internationally. I personally prefer an inverter to a dedicated EmPower tip for charging my stuff because I can plug in a small 3-way outlet to the inverter and charge batteries, my cell phone and my laptop on a flight. All three of these items don’t draw anywhere near enough power to max out a 75 watt or 90 watt AC/DC inverter , even from seat power. Once I am off the plane,I can take my inverter to the rental car and plug it in, all in one unit. My preference for AC/DC inverters, with EmPower are the APC 75watt travel units, which have recently been replaced with a 90watt travel unit. The device is small, light, durable and very reliable,mine have been around the world and dropped dozens of times. It is rare to find cigarette lighter outlets on planes, however American Airlines (AA) offers this kind of power outlet of almost all of it’s MainLine aircraft. 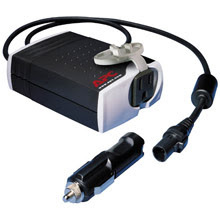 The EmPower power leads and inverters can all be used in a cigarette adapter. While I am not one who likes American Airlines, I do like this power option. As I had mentioned above, finding flights with power is a priority for me on certain routes. When booking flights with my preferred airlines I search for certain flights on certain aircraft. US Airways: All the US Airways (US) Airbus aircraft, A319, A320, A321, A330 have EmPower in every seat. Even in coach flying a plane that lets you have power for 4+ hours makes the flight much more relaxing. One thing that can be confusing is the recent merger between US Airways and America West (HP) , the US aircraft (tail number ending in US) have EmPower on all Airbus aircraft but the HP aircraft (tail number ending in AW) do not have EmPower. US Airways calls “US” aircraft the east coast fleet and the “AW” aircraft the west coast fleet. You should be able to find out which “fleet” your aircraft is coming from by call US Airways. The airlines know which aircraft you’ll be on because the planes have different seat configurations, and they must know the seat configuration before they sell any seats.